I know I'm not the only parent who loves long summer days more than the daily grind of the school year. And I have to say this has been a particularly magical summer. We've actually had several mornings where we've been able to sleep past 8am (a weary mother's miracle) and spent whole days lazily watching the time just linger by, indulging in board games, art projects and lots and lots of swimming. We've also had plenty of play dates, and family and friends around, so we've been doing out fair share of cooking as well. Chloe and two of her friends, Olive and Kate, were at the house one day last week, swimming and splashing around for hours. Then, as if on cue, they barreled into the house asking for ice pops. I wasn't surprised. 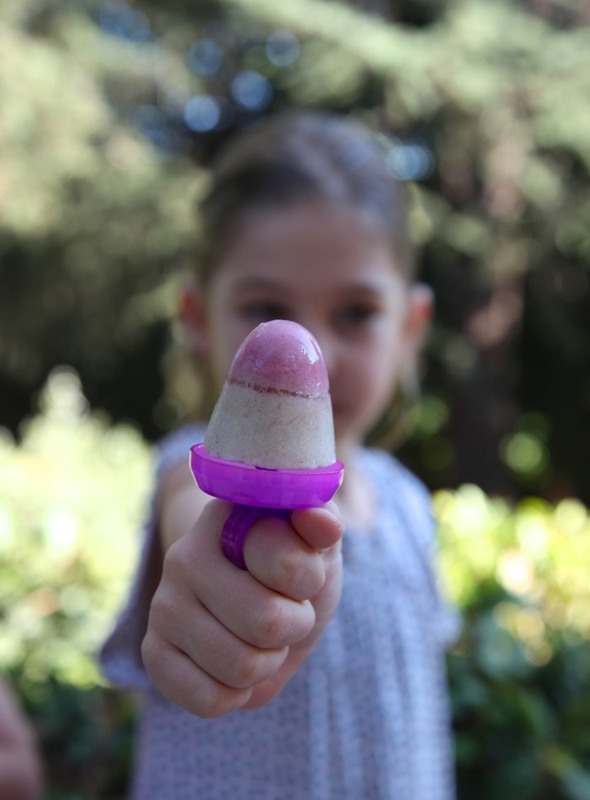 Kate, who's 9, had just spent the day cooking with me, so she knew that the Strawberry Banana Almond Milk Pops we had made just hours earlier must be ready. 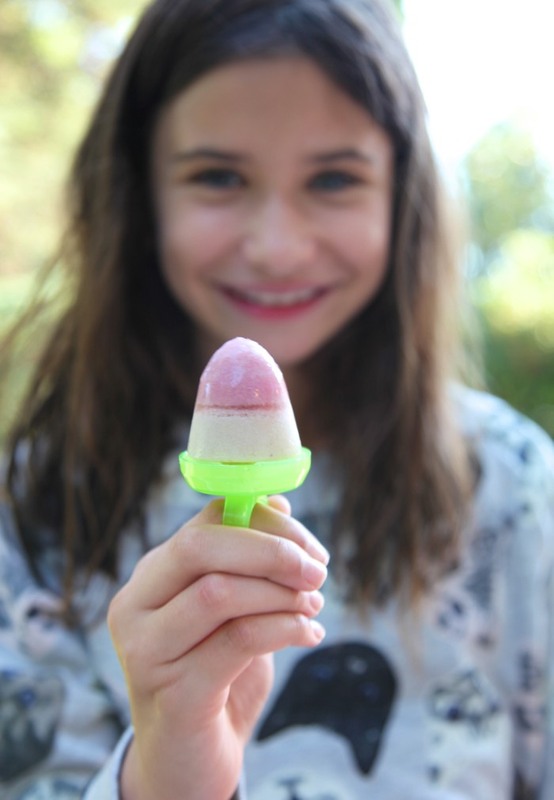 We made the pops in these adorable ring pop molds (the girls each ate two each), before diving into these old fashioned molds using wooden popsicle sticks. 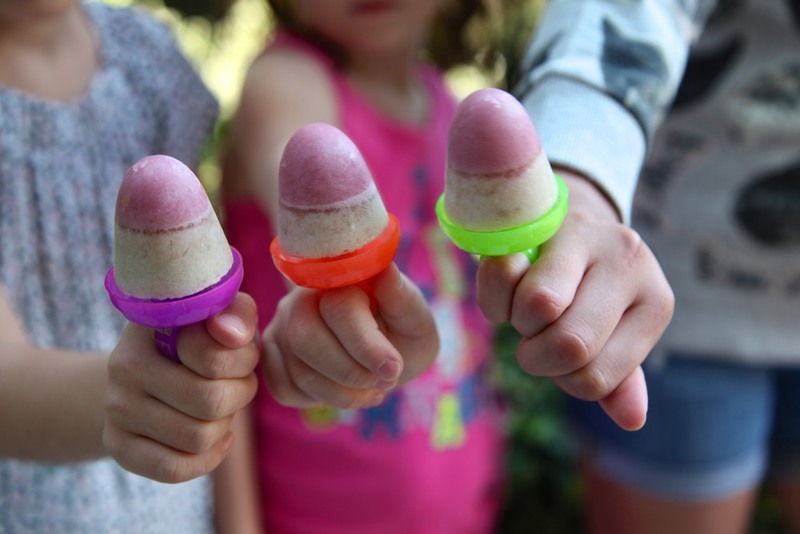 The girls sat on the porch licking their ice ring pops pretending they were giant two toned gems on their little fingers. 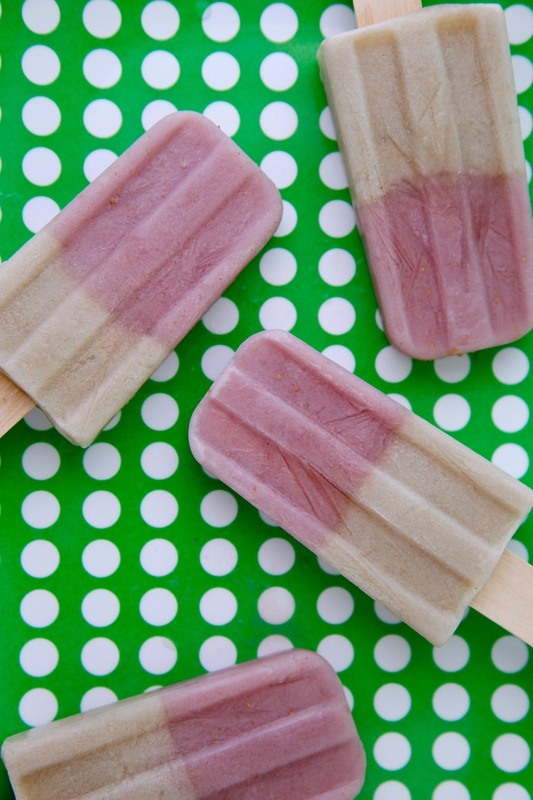 These Strawberry Banana Almond Milk Pops are great for kids (and adults) who can't have dairy, but since they're made with vanilla almond milk they still have the sweet creamy flavor you'd get from regular milk (although you can totally substitute cow's, rice or soy milk for the almond milk if that's all you've got on hand). With temperatures plenty high throughout the country and fresh strawberries still in season this refreshing treat couldn't be more ideal to help prolong the fun of these waning days of summer. 1. In a blender combine 1 cup of the almond milk, strawberries and honey. Puree until smooth. 2. 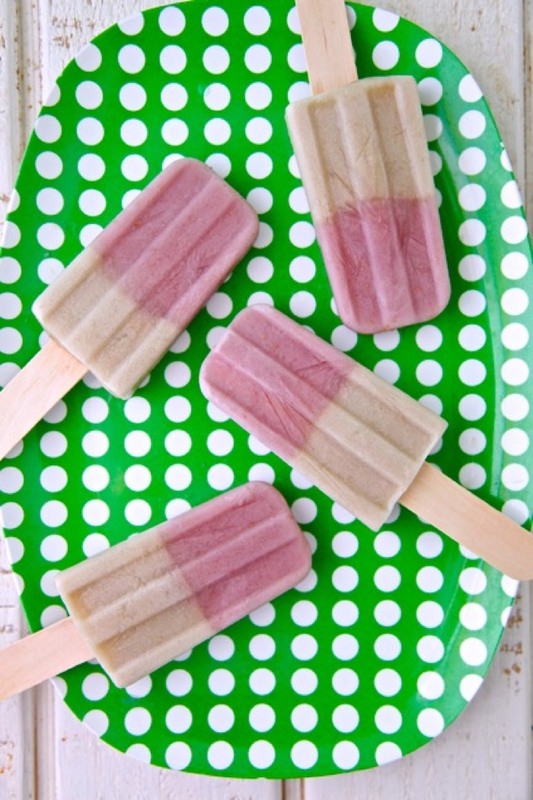 Pour mixture half way into popsicle molds or Dixie cups and place in freezer for 1 hour. 3. Meanwhile place remaining cup of almond milk and banana in blender and puree until smooth. 4. Remove pops from the freezer after 1 hour and pour the banana puree in the molds or cups, filling almost up to the top. 5. 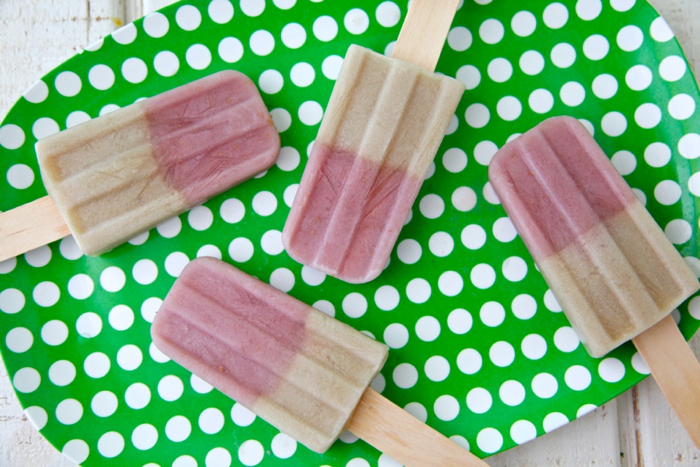 If using popsicle sticks, stick then into the pops, making sure to press firmly so the pop stick goes through the strawberry layer. 6. Freeze 4-6 hours before serving. These sound yummy! Going to try them tomorrow! How long do you think they would keep for in the freezer? My son is allergic to tree nuts. Would whole milk and vanilla work instead? Those ring molds are so cute! 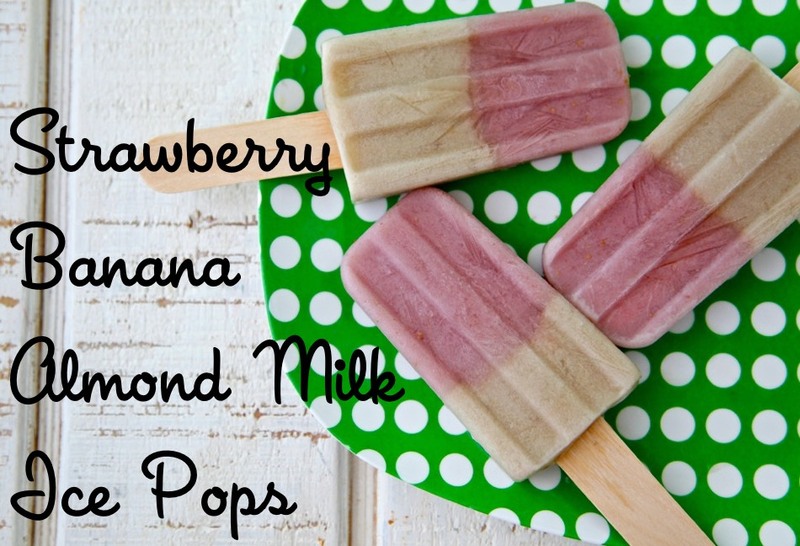 I have to get some for the kids, they would love these pops too! OMG my hubby let my son choose between pre packed ice cream from the super market and this popsicle. Amazingly he wanted this one. I am so happy. Not feeling guildy of giving my son ice cream. I did not have almond milk. So i looked for your recipe of vanille milk.